Yesterday we went to Brasília's city park. It's really nice! On the way, we passed a fruit stand, and guys, I couldn't believe the bounty. 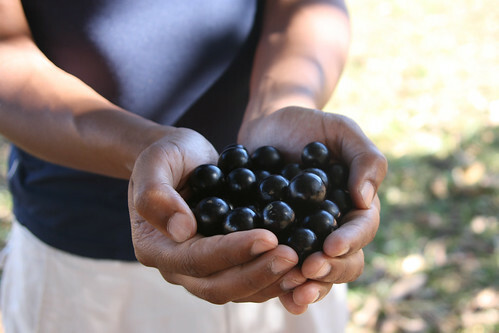 You are in for many fruity treats over the next few days, starting with today's fruit, the jabuticaba. Brasília has great architecture (that is, in fact, quite futuristic). 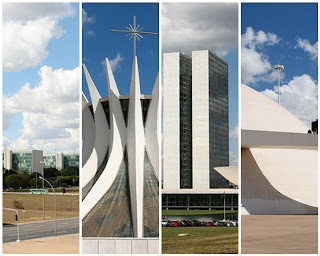 Most of it was designed by Oscar Niemeyer, who has a very informative Wikipedia page. All of our Brasília pics are on Flickr. Now let's talk about jabuticaba. Jabuticaba also goes by Brazilian grape, and a slew of other names that you can read all about - where else? - on Wikipedia. Jabuticabas are about the size of a big grapes, are squishy like a little rubber balls, and are very dark purple - almost black. The first jabuticaba I ate I didn't like at all. It was super bitter. Then I tried eating the insides only, without the skin, and discovered that that's the way to go. The insides taste like grapes, only even sweeter, like Welch's grape juice. The pulp is very white, and each fruit contained one or two seeds that were easy enough to spit out, especially since we were eating them in the park. 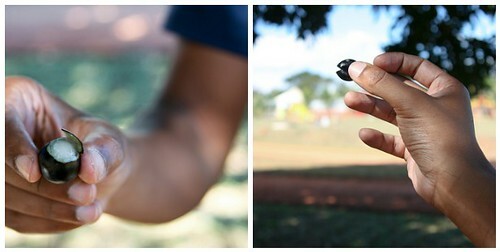 If you get your hands on a jabuticaba, we recommend putting the whole berry in your mouth, biting to break the skin and release the delicious pulp, then spitting out the skin and seeds. If you do it just so, you might end up with a little jabuticaba Pac-Man. You can listen to it (for free!) on Grooveshark. P.S. We have a lot of new fruit just waiting to be discovered here on Ultra Fine Flair, and I can't decide which one should be up next. So... you get to choose tomorrow's fruit! Vote early and often!